As you gear up for the new school year, try the newest features in Google Classroom for more ways to save time, engage your students and keep everyone organized. Most of these features are rolling out this week; stay tuned in the next few weeks for more back-to-school goodies in Google Classroom, Google Docs, Sheets and Slides, all designed to help you make this school year yours. Since Classroom launched last year, teachers have been using their class stream to host student debates, Q&A and discussions. Starting today, you’ll be able to do this in a more collaborative way. You can post questions to your class and allow students to have discussions by responding to each other’s answers (or not, depending on the setting you choose). For example, you could post a video and ask students to answer a question about it, or post an article and ask them to write a paragraph in response. You know those lessons that worked so well last year that you want to use them again? Now you can reuse assignments, announcements or questions from any one of your classes — or any class you co-teach, whether it’s from last year or last week. Once you choose what you’d like to copy, you’ll also be able to make changes before you post or assign it. In the next month, Classroom will automatically create a calendar for each of your classes in Google Calendar. 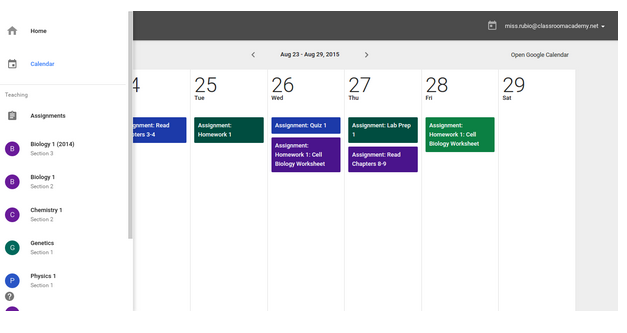 All assignments with a due date will be automatically added to your class calendar and kept up to date. You’ll be able to view your calendar from within Classroom or on Google Calendar, where you can manually add class events like field trips or guest speakers. Bump a post: When you want to make sure an older item is easy for students to find, you can now move any post to the top of the stream. Due dates optional: For long-term projects or student-driven assignments, you’ll now have the option to create assignments that don’t have due dates. Attach a Google Form to a post: Many teachers have been using Google Forms as an easy way to assign a test, quiz or survey to the class. Coming in the next few weeks, teachers and students will soon be able to attach Google Forms from Drive to posts and assignments, and get a link in Classroom to easily view the answers. We know YouTube is an important source of educational content for many schools. Because it also contains content that an organization or school might not consider acceptable, last month we launched advanced YouTube settings for all Google Apps domains as an Additional Service. These settings give Apps admins the ability to restrict the YouTube videos viewable for signed-in users, as well as signed-out users on networks managed by the admin. Learn more here. All of us on the Classroom team have been deeply touched by the teachers in our lives, who inspire us in the work that we do. For me, that’s my brother Tuan, an English teacher at the Chinese International School in Hong Kong. We make these products for you. And we hope these new features will help you kick off another incredible year of teaching and learning.